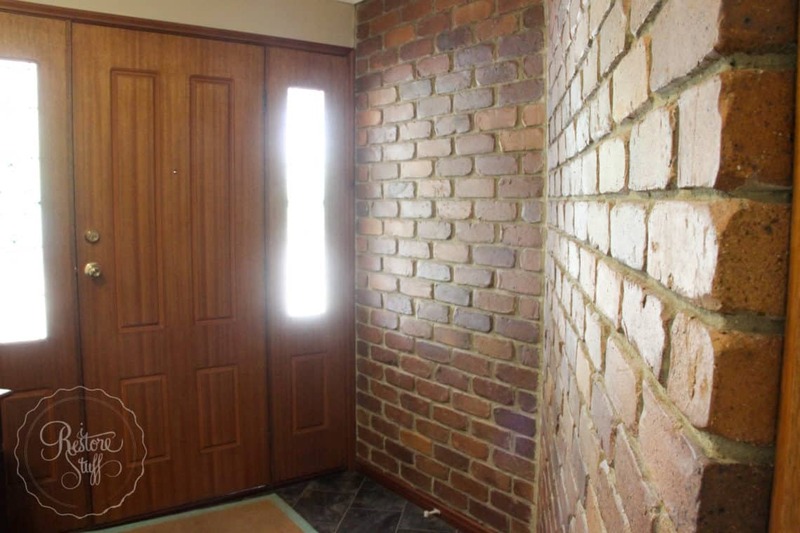 I’ve been annoyed by the dim darkness of our brick wall entry way for years now. I mean, seriously this photo below makes it look a lot lighter than it really is in the middle of a sunny day! I have to turn the light on in this little space every time someone comes to the front door! I’ve been painting so much furniture this year, but none of it has been for our home. It’s all to sell or restore for others. 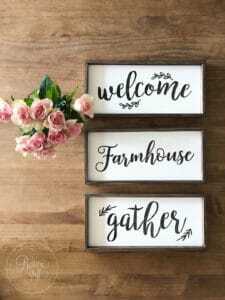 But I began to look at my stockpile of saleable items and thought it was high time we made a dent in some of the much needed updates around our own home. The entry of the house seemed a good place to start! This is a view of the front door taken from the brick wall side of the entry way. See that hall table against the wall? Maybe I should paint the front door soon too, what do you think? 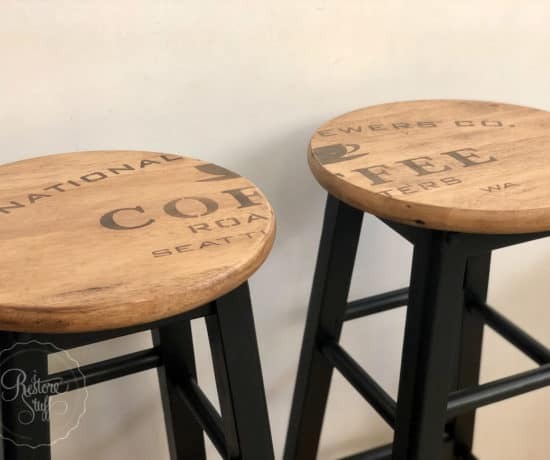 I love Miss Mustard Seed’s Milk Paint for it’s authentic rustic aged look and that was the exact feel I wanted for our brick wall. 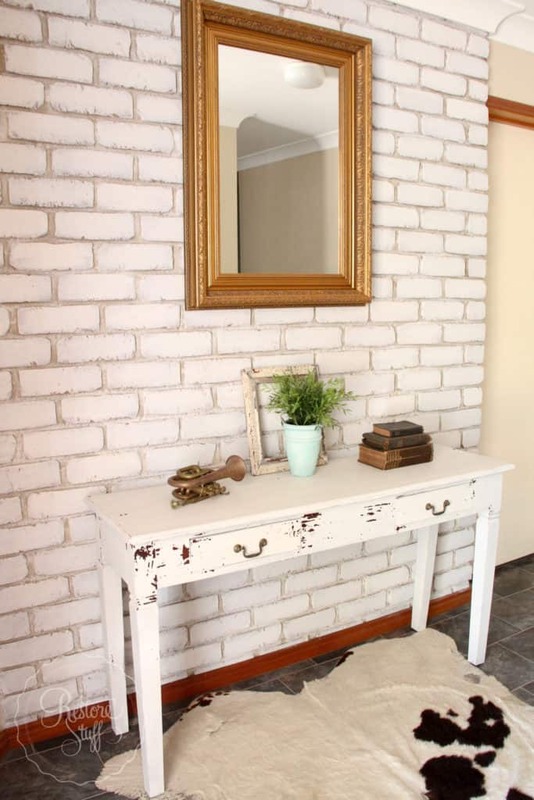 A rustic French Country weathered wall! Here’s a progress video I showed on my Facebook page while I was doing this, showing you exactly how quick it was to apply. I love the white look, having left some of the Grainsack show through slightly in some parts, and the mortar left alone too. And remember that hall table? 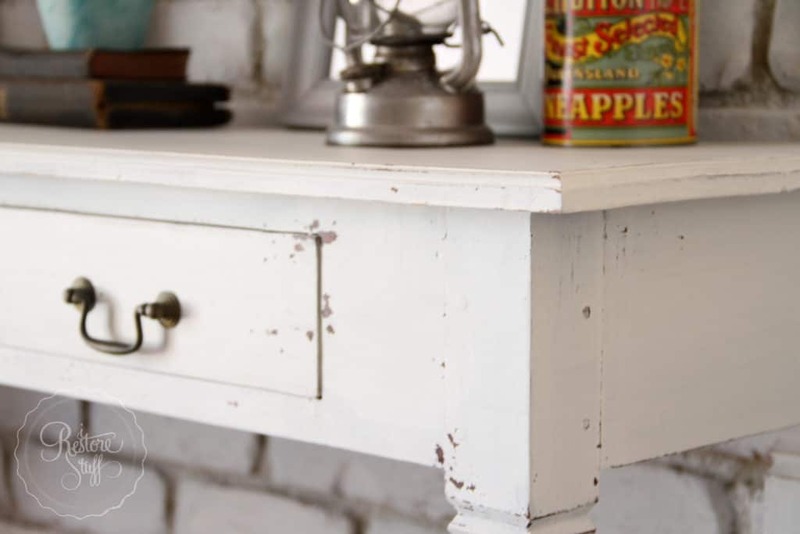 It’s roughly sanded back here and ready for a Miss Mustard Seed’s Milk Paint makeover in Farmhouse White too. I used two coats of Farmhouse White without any bonding agent, which resulted in a lovely amount of chippy goodness. I’m so happy with the result of that wall. 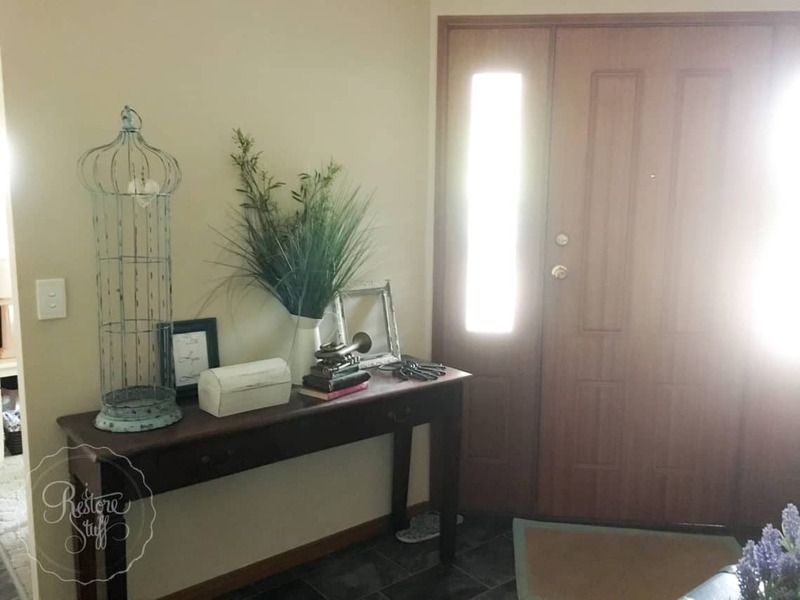 It really lightens up the whole entry way. I feel like I’m still in the learning stages of staging. Ugh, I actually feel a bit hopeless about staging to be honest. After taking the above picture and starting to edit the photos, I felt the hall table was too cluttered, so I went back for a re-take and came up with a simpler look below … I’d love to hear your thoughts on staging. Simpler staging – yes or no? Leave a comment if you have any helpful advise for me in the “case of the cluttered hall table”! Haha. Meanwhile on the other side of the entry, I dragged out an old wash stand I had in another area of the house, to see how that worked in this space. Not sure I’m convinced it needs to be here, but it will do for now. Behind this entry way wall, is our living room, where the dark brick continues as a feature wall for that room. This was such an easy project to complete. 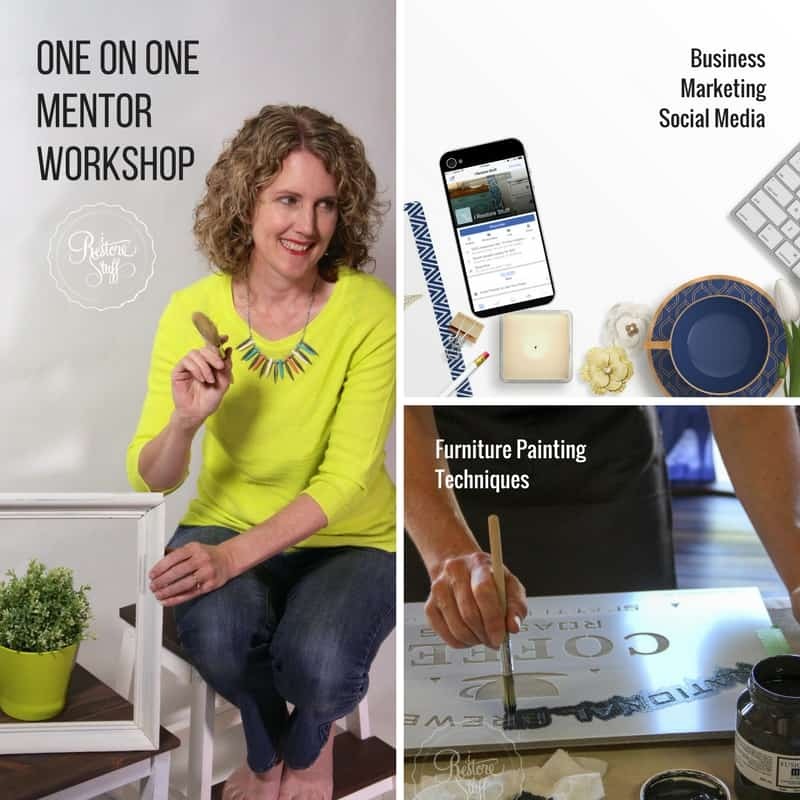 If you need further instruction on using Miss Mustard Seed’s Milk Paint, you can view the tutorials I have here on my website under the Tutorial tab. 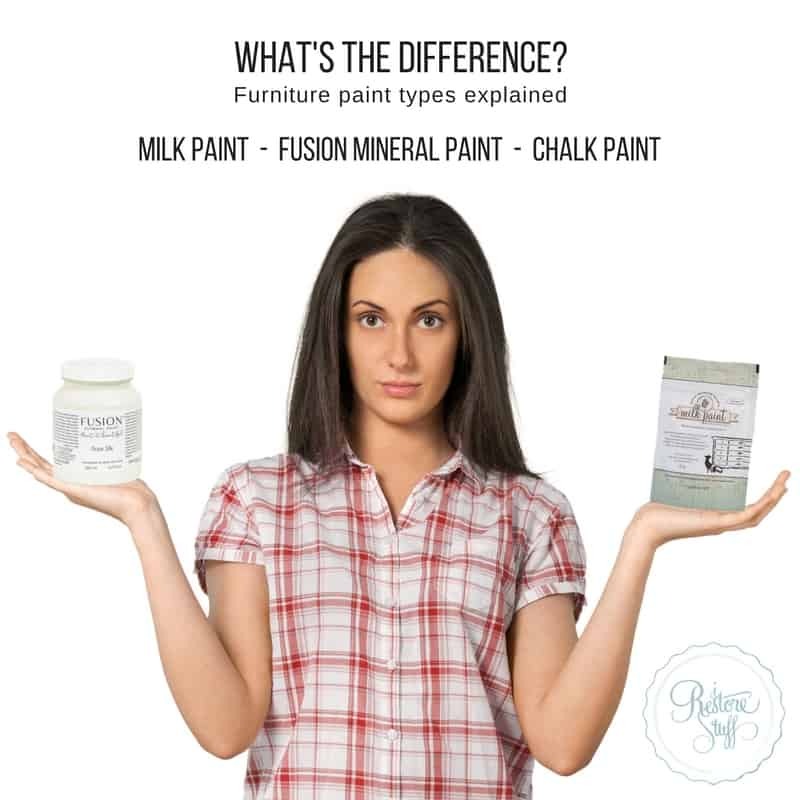 I hope this post has encouraged you to think outside the box when using Miss Mustard Seed’s Milk Paint as there are so many different applications for this natural, eco friendly paint. 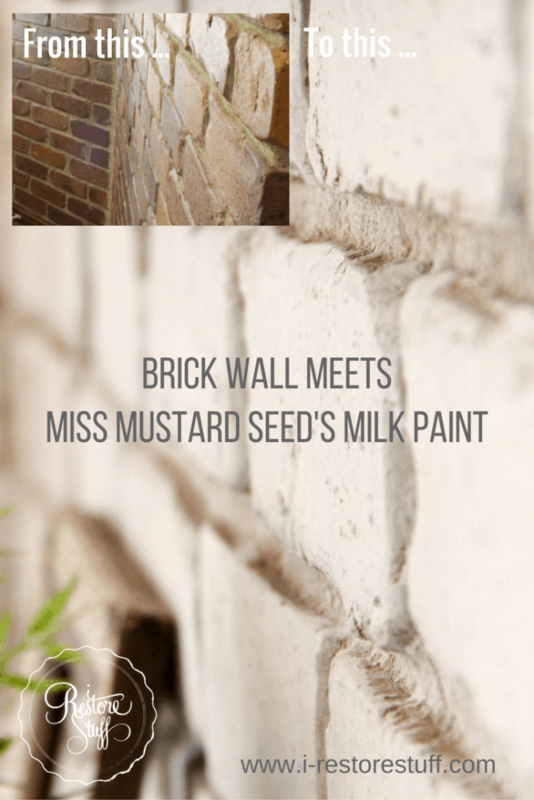 Here’s another post on Painting with Miss Mustard Seed’s Milk Paint on Walls: You may also like this blog post on 5 Ways to Paint A Brick Wall. Pin this image and share to your Pinterest boards! How to Strip Paint the Quick and Easy Way! Everything looks beautiful! Quite the transformation! For a suggestion, you might want to try removing the empty picture frames. It feels like their shape is competing with the shape of the mirror above the table. Also, consider staging the table top in an unbalanced way which would give it a more informal look. In these pictures, the arrangement is balanced with an equal number of items (groupings) on each side. Larger plants would add some height to the staging (it’s a big wall) or grouping them all together on one side in varying heights with other items placed across the table top. Love all the colors and individual pieces! Thanks for sharing! 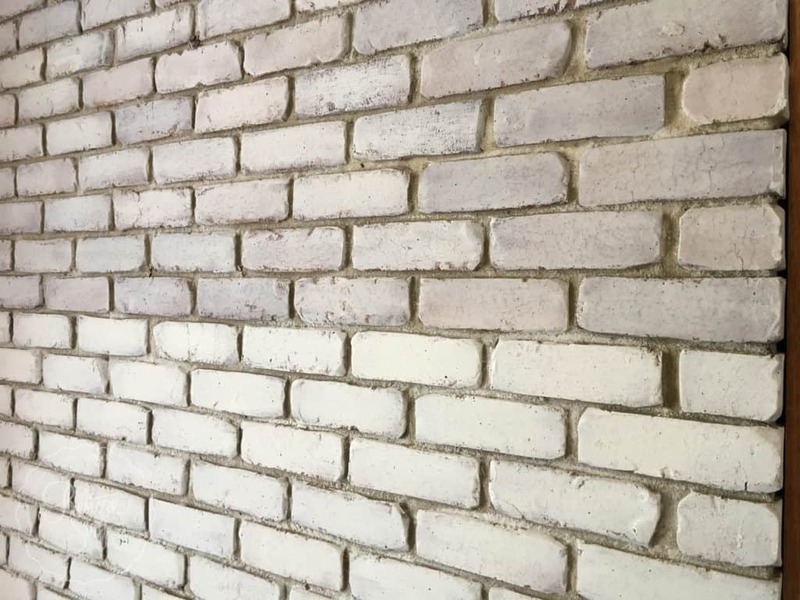 My brick is shiny and therefor I believe it has some kind of sealer on it what bonding agent would I use? If it has a sealer on it, I would scuff sand it just to make sure the paint has a little more to grip onto. If using Miss Mustard Seed’s Milk Paint to paint your wall, mix a little Miss Mustard Seed’s Bonding Agent into the paint. You only need to add the bonding agent to the first coat. That’s a great improvement to the hall. Clever to think of it, Sharon. Lovely blog you have by the way! I am also a fellow restorer and love milk paints. I have been overseas for a few months and arrived home yesterday. Discovering this post has been the inspiration I need to start on a new piece after months away from my paintbrush! Thank you! Love the painted brick! The only thing I might consider doing is dropping the mirror by 2 rows of brick. That way some of your pretties would be reflected in it. Otherwise, great job! I think the white picture frame needs to be bigger, and like the larger brown one further down, also to even on both sides like Cynthia said above, unbalance it more…? 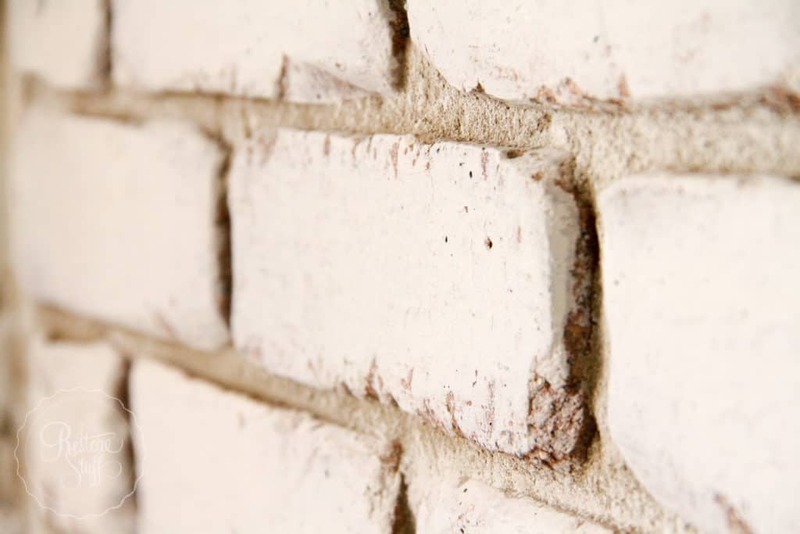 Couple questions, after your second coat of paint it looks like you hit more of the mortar than after your first coat….and I like that look, but you did or didn’t intentionally swipe paint onto the mortar? Just what ever happened to get swiped on it? 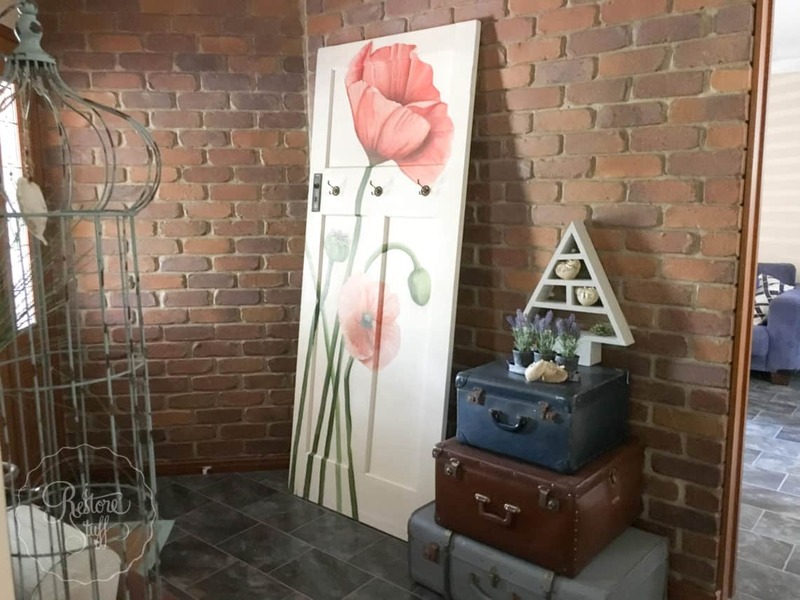 And, I think painting your door, just like the one in your before shot….with that big beautiful flower on it would be gorgeous on the real door. Great job. Thanks Kris. I love that little chippy white frame which is original paint and chipping perfectly, but you’re right I could use a bigger one. Yes, I intentionally hit a little more of the mortar in random places, but not everywhere. 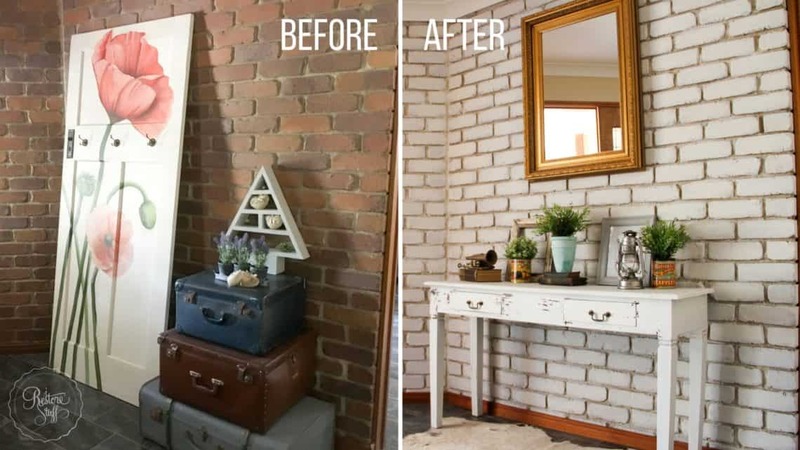 The painted brick looks so much nicer but I feel the gold mirror frame is hung way too high. It should be below the frame of the door. 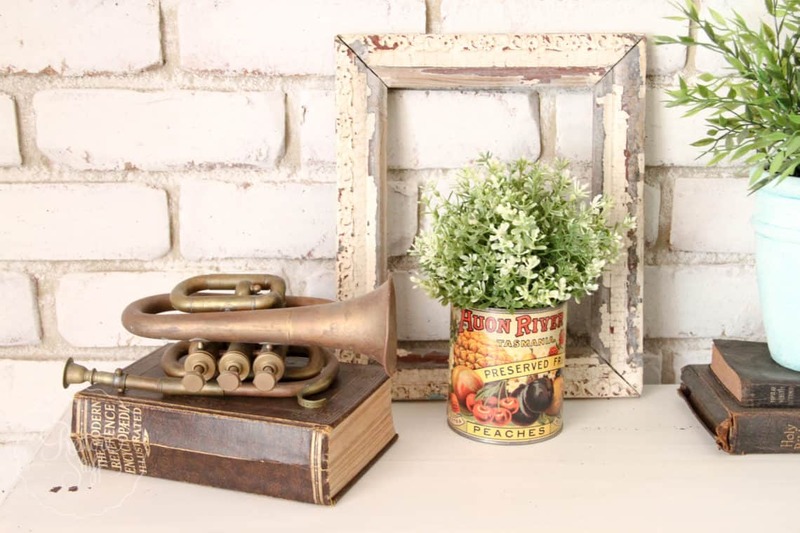 Place something larger like a topiary plant and other collectibles in an odd number on the table and that’s it! sweet! Thanks for your ideas Lorrie. The mirror is a little high isn’t it. I was using existing hooks that were in the brick wall. Might have to look at placing a lower one. What a difference and it totally lightens up the space. I love that its a matte finish, looks just beautiful! 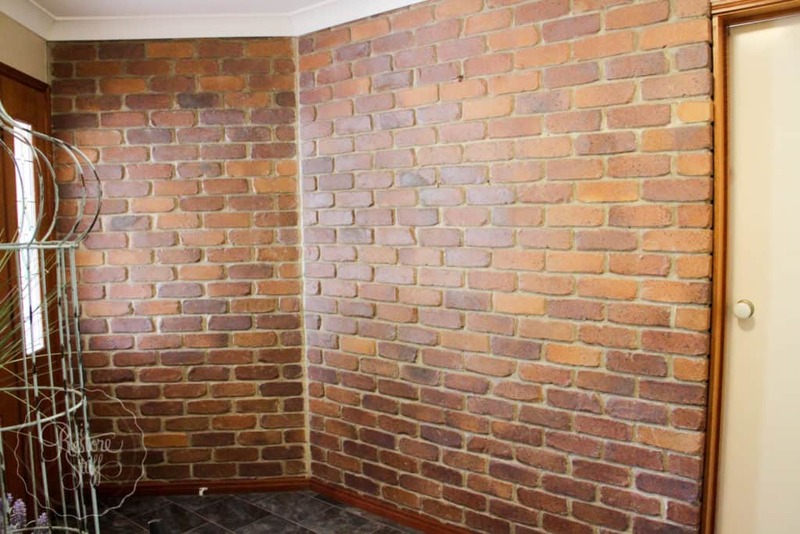 I love the two tone look to the brick wall. 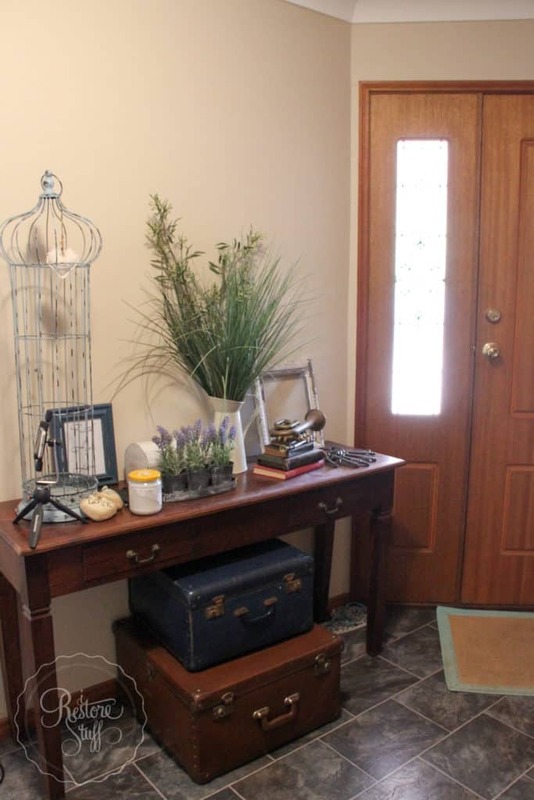 As for your staging, I am no expert, but I think you need slightly larger/taller items, the mirror on the wall…I would tone down the frame color but add some metallics to items on the table. Again, just my opinion. I LOVE the door with the big flower on it! Thanks for your tips Lisa. Great thinking! Yes, the door was painted by a friend and you can see the time lapse video of her painting it on my blog or youtube channel. 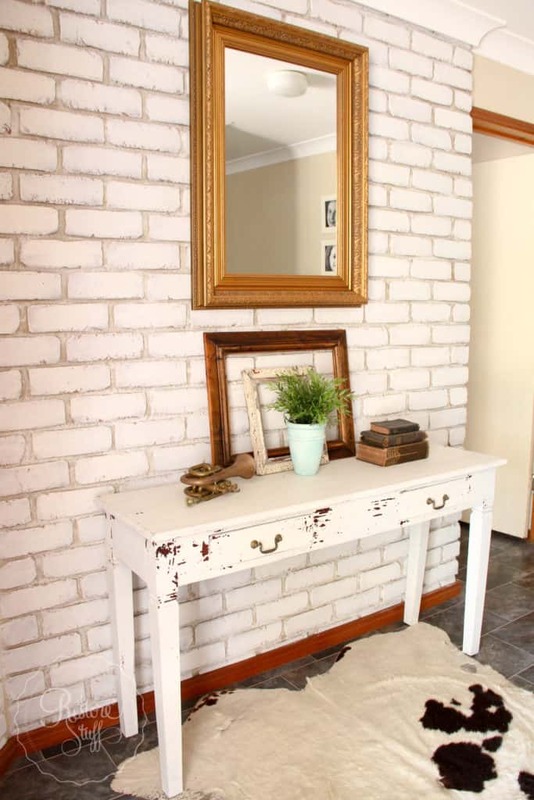 I absolutely love the painted brick and the chippy table! I would although get rid of some of the competition on that table. 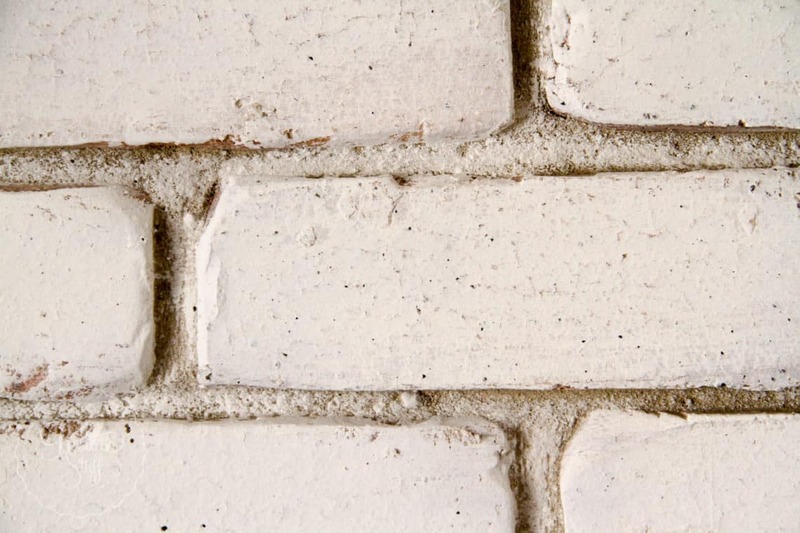 The brick has so much texture and pattern that the small items on the table look too busy. I would hang the mirror sideways and maybe crackle it so just a little gold shows through. 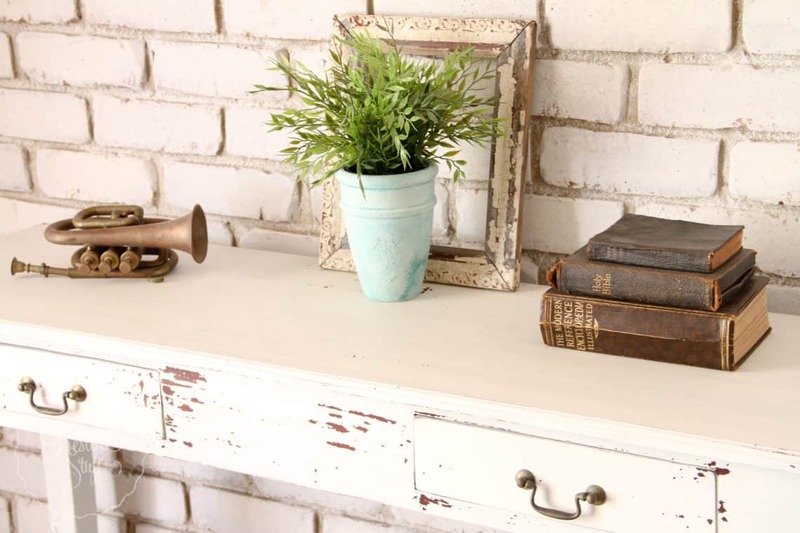 Maybe a lamp or tall candle sticks, books tied with jute….maybe a little lavendar sprigs on top. I wish I had your brick wall though! 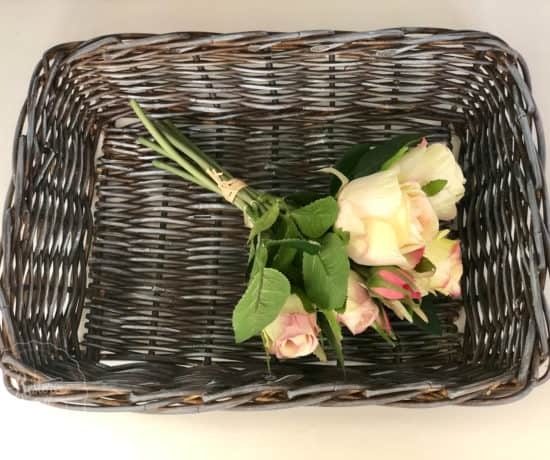 Hi – The space looks great! Unless you are all very tall, I’d try lowering the mirror so the space between it and the table isn’t so large. Also, someone had a good idea of offsetting the tabletop displays. Maybe one larger piece and 2 smaller. 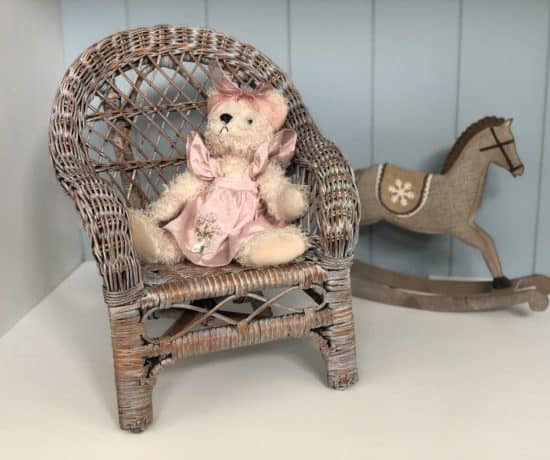 Or two taller lamps or candlesticks on either side of the mirror and a flat basket in the center to hold some of your favorite smaller things. Have fun, most of all! 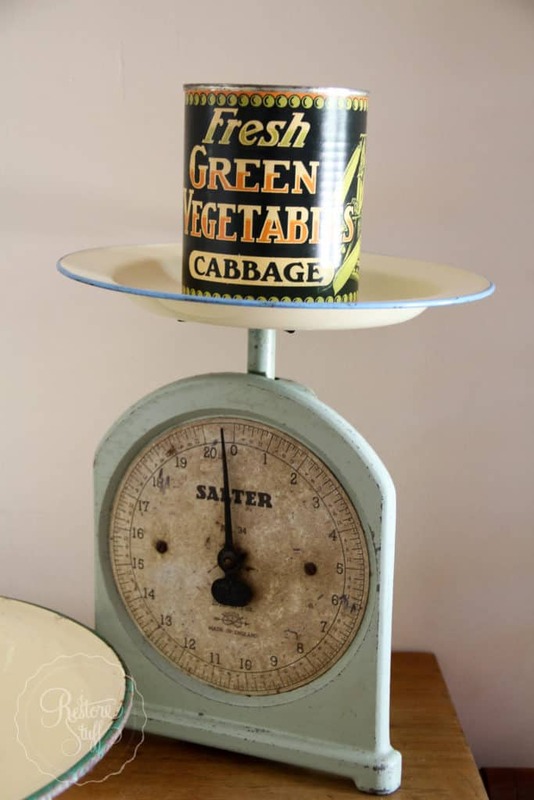 Yes, agree with the mirror height. I was using an existing hook that was already in the brick wall. 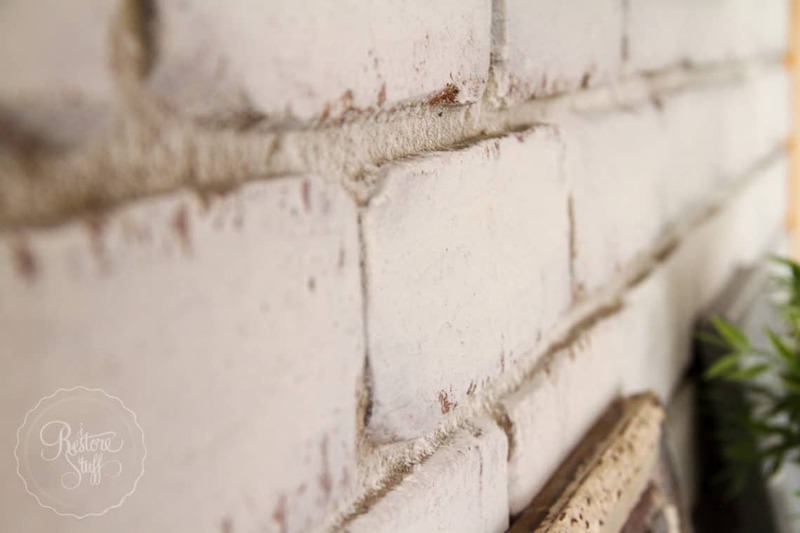 I love the painted brick. I have a fireplace I am going to work on. You also need a little color on your staging. Lower mirror, have a big colored vase on one or both sides with flowers, sticks, grasses, or other dried good s that enhances the look. Clear vase at Christmas with peppermint or other candies. Love, love the table. It looks amazing on the wall just add a color underneath it with a color of basket s. I love some towels to towel off dogs adults and umbrellas. The other container is for used towels. Also an old container for umbrellas on the wall would look beautiful and convenient. Love these ideas. Especially the towel baskets for rainy weather! You are a very talented painter. I have admired many of your projects. 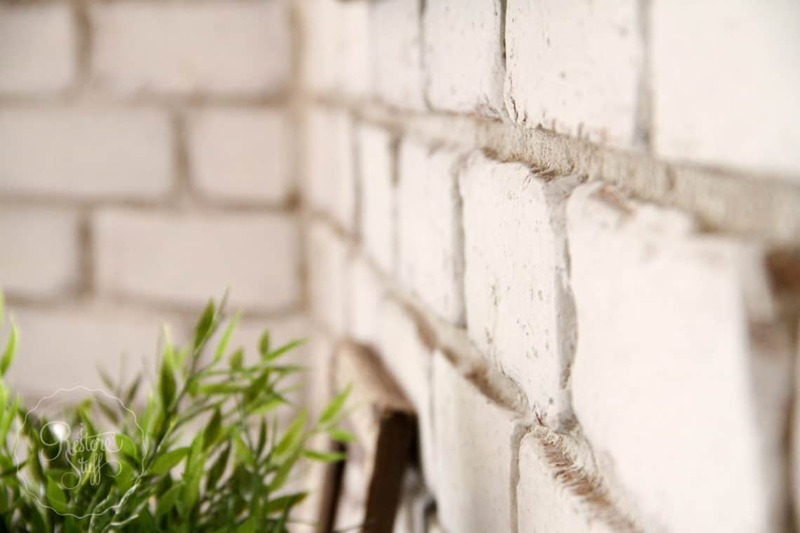 The painted brick looks very nice. 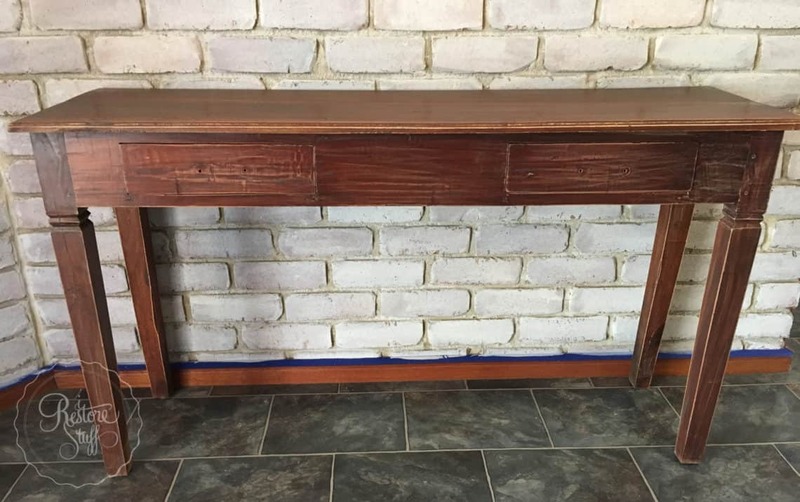 Its just my opinion but the white chippy table detracts from the brick wall. Maybe a table with a bit of contrast? A lamp would be good for the table. Also consider using something UNDER the table, such as a stack of suitcases or a large basket. 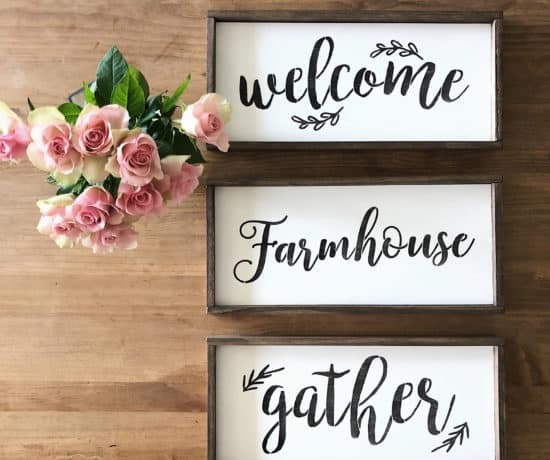 I recommend that you practice staging by trying to copy nice vignettes that you see on Pinterest or blogs that you read. 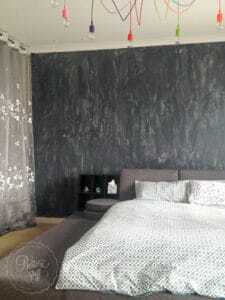 Emily Henderson has several posts on her blog that give professional advise on staging various spots in you home, I.e. bedside tables, shelves, and sideboards. Good luck! 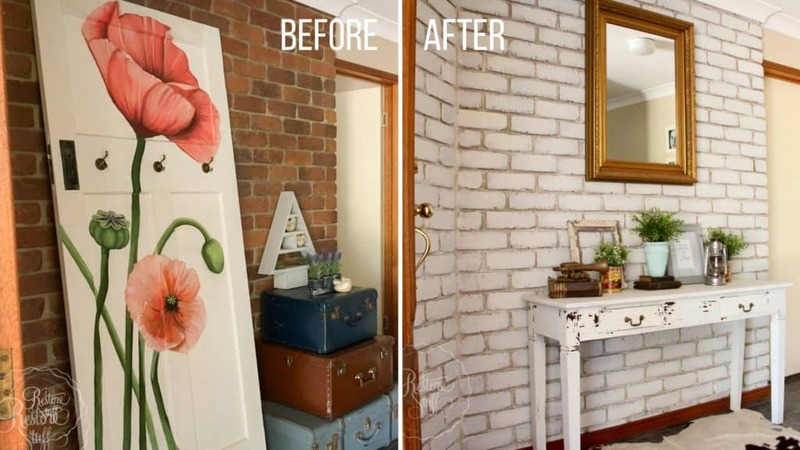 Honestly prefer the flower painted door (did you do?) with stack of dark suitcases but ditch the top decorations – just use that lovely mirror. 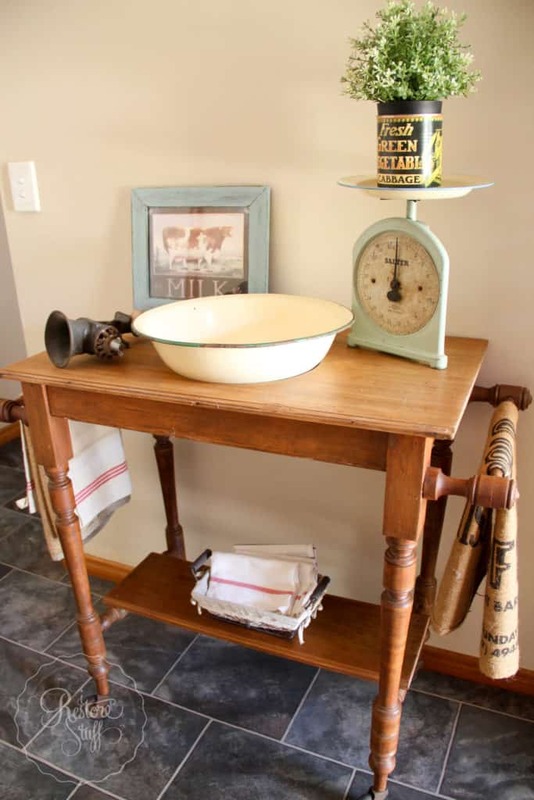 The other side of the room is perfect using the washstand – don’t change a thing. 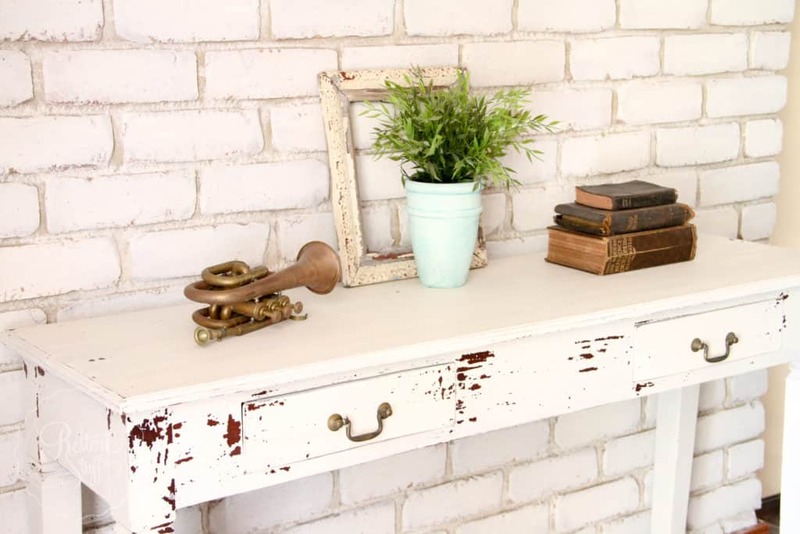 The whole room is brightened and improved with milk paint on the bricks. 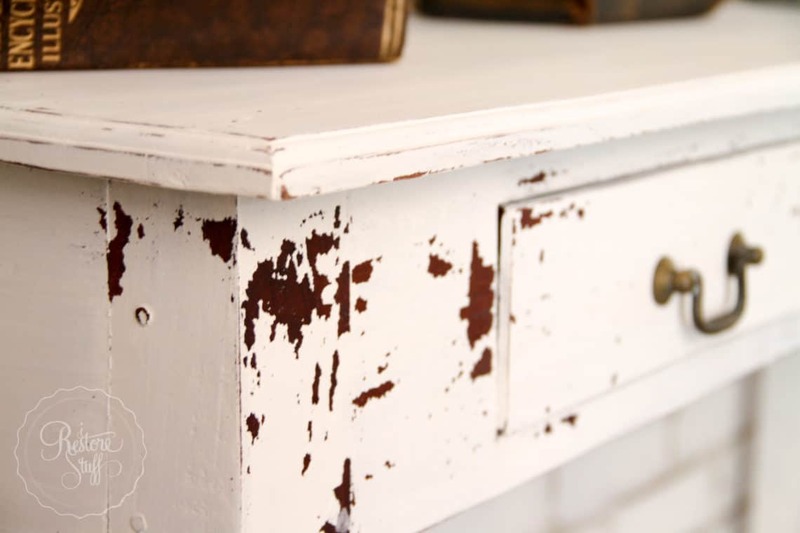 I didn’t care for paint on table – looks just chipped rather than antique worn. 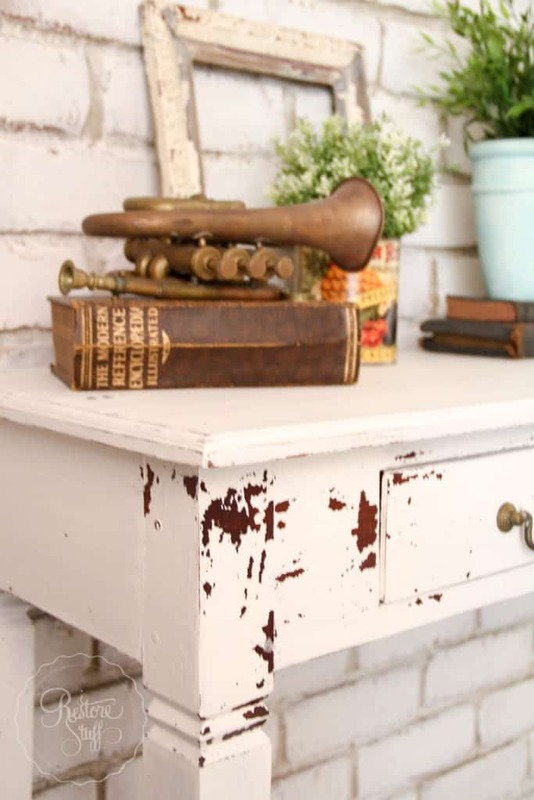 Do you use dark wax to pick out furniture accents after the milk paint? Seeing the after picture was quite surprising; the huge difference it made. No less that amazing. Do you think that paint would stand up on a rock fireplace? The rocks get pretty warm after an evening of burning. Not hot enough to burn if you touch it but warm enough to give off ambient heat for quite a while after the fire is out. Can you use milk paint around a fireplace or is it too flammable? 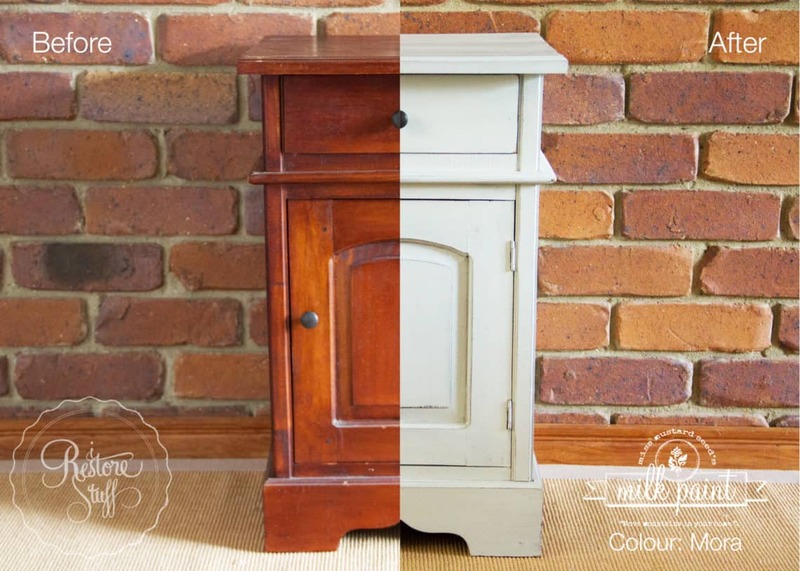 I haven’t personally used it on a fireplace, but there are several blog posts online where people have used Milk Paint successfully on fireplaces. Once the paint is dry, I’d say it is fine. 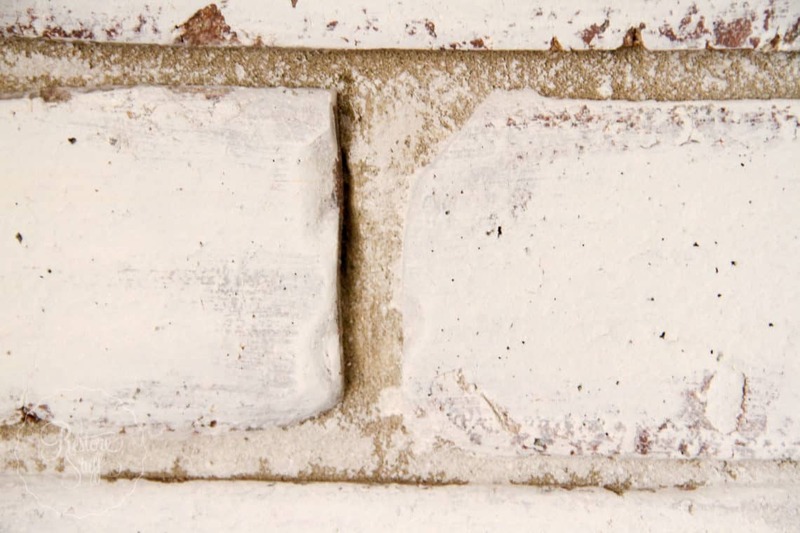 It also soaks into the brick work, becoming a part of the brick surface, so adheres quite well and very durable. You don’t have to undertake the daunting task of lowering and adding another hanger on the wall. You can buy a longer mirror or you can use the existing hanger to hand a chain or braided cord and attach your mirror lower to the chain or cord. Just a thought, because I HATE adding more hangers on a wall. You could literally forget about plants on the table and merely place a large “corn plant” or topiary on the floor. 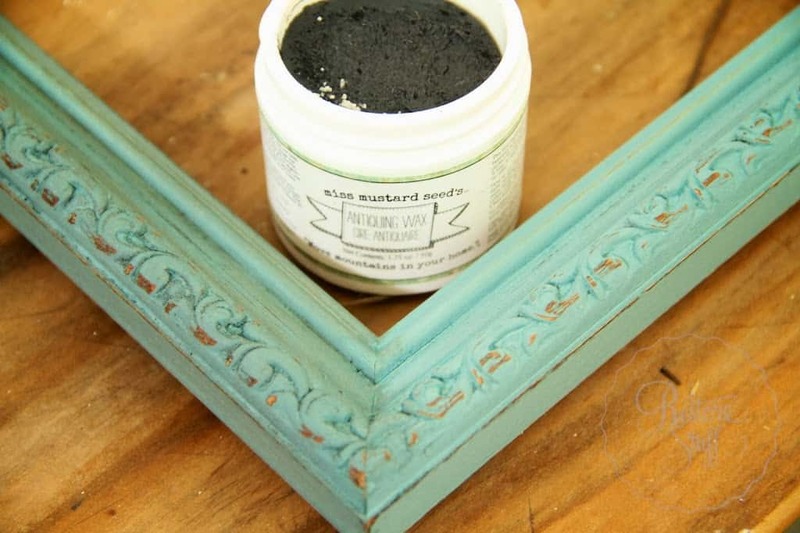 Since the gold frame is the only gold in the room, try a bit of the mustard paint in black or gray and antique the frame. NOT TO SAY THERE’S ANYTHING WRONG. I could never be half as brave as you are. It is a beautiful transformation!! 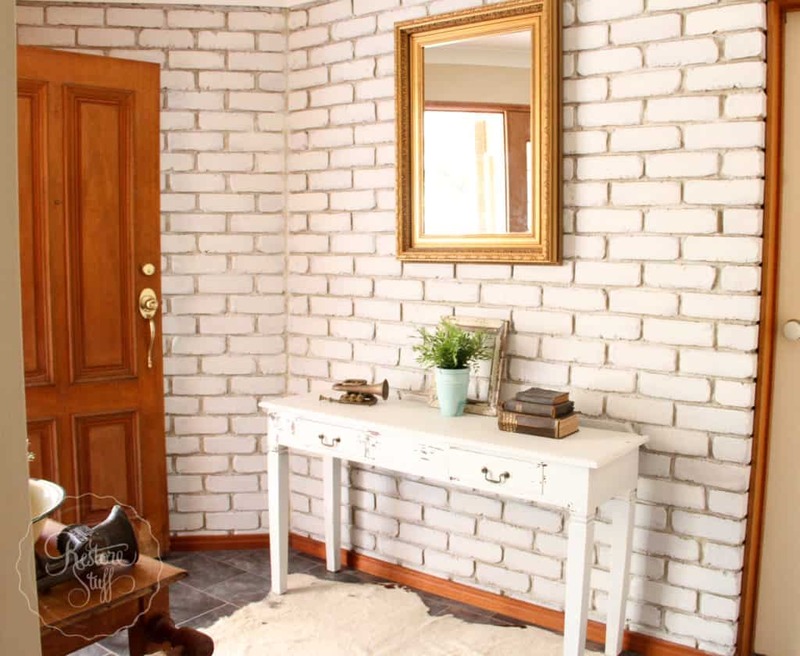 I love the painted brick & setting. 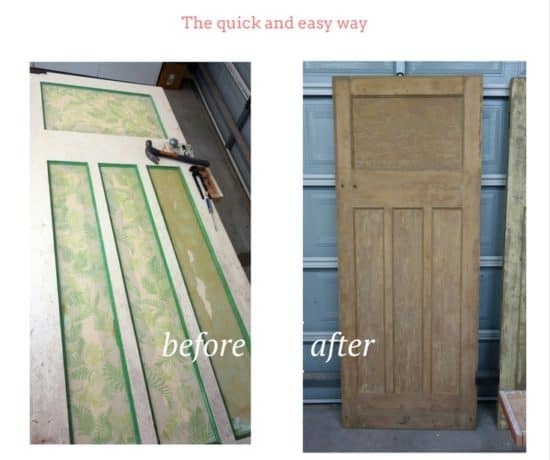 I would paint the front door to complement the rustic milk paint &, similarily, either change the mirror to a more rustic style or paint its frame to coordinate with the new look. This will make the area feel complete. Beautiful, a job well done. I am with the other suggestions to offset the table arrangements it will expand the look. I would also get rid of the dark baseboard think it looks out of place even though it is same color as the door. 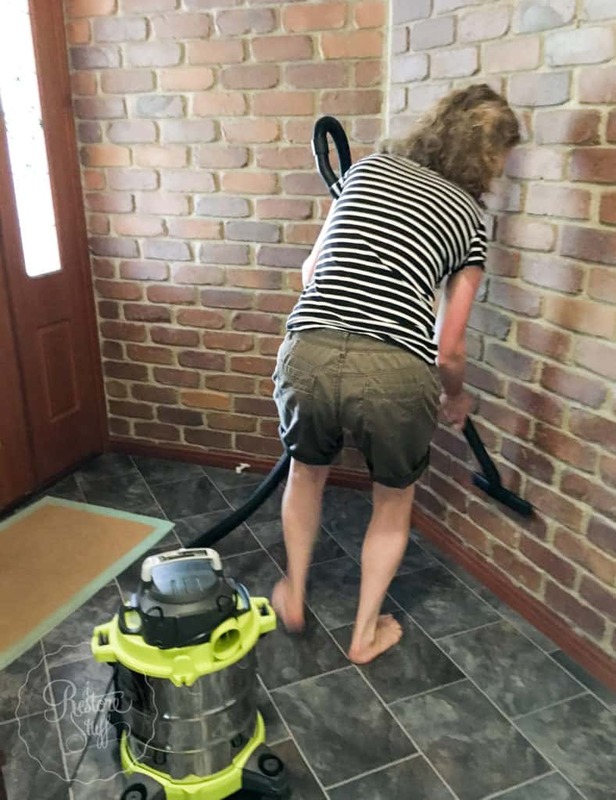 It appears in the picture that the brick continues to the floor shouldn’t be to much to remove it. 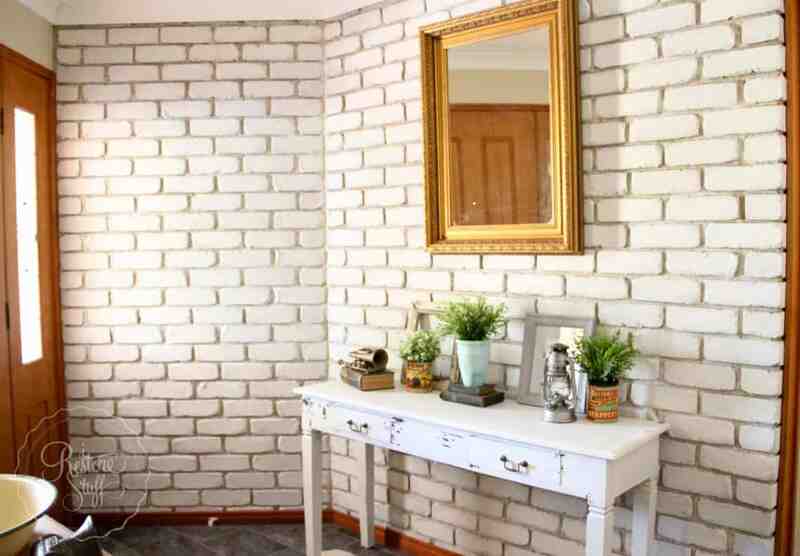 Brick walls don’t need a baseboard. 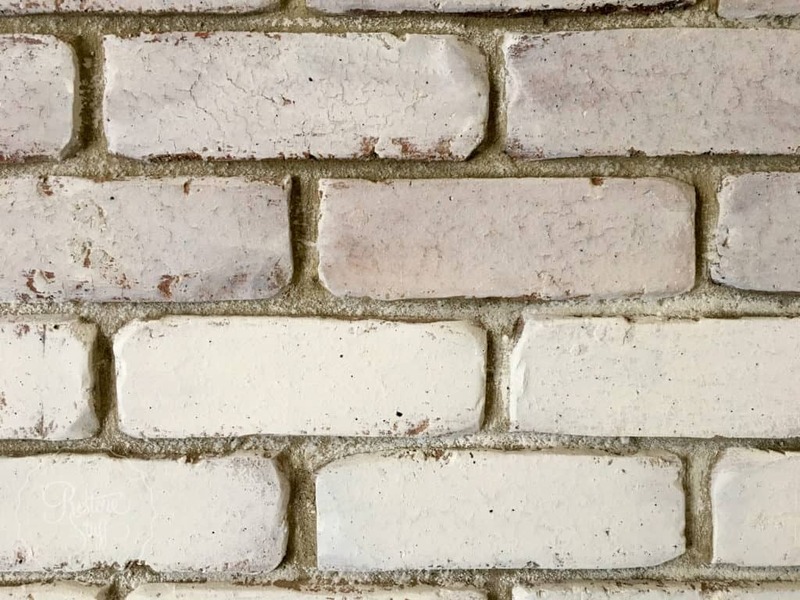 After seeing your beautiful brick I am going to take a pic of mine and see what improvements that I can make. I know I am coming in late, and I am sure things have evolved beyond what we see in todays reposting. My suggestion would be to add round or curved things. Walls, door frame, bricks, mirror, frames, and floor tiles are all angular and some curves would add more interest. I am a big fan of your paint treatment, you made the space so much lighter and more welcoming.